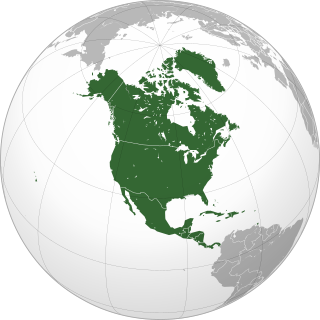 This article is about the North American region. For the African region, see African Great Lakes region. For other uses, see Great Lakes (disambiguation). Hudson Bay is a large body of saltwater in northeastern Canada with a surface area of 1,230,000 km2 (470,000 sq mi). It drains a very large area, about 3,861,400 km2 (1,490,900 sq mi), that includes parts of southeastern Nunavut, Saskatchewan, most of Manitoba, Ontario, Quebec and indirectly through smaller passages of water to parts of North Dakota, South Dakota, Minnesota, and Montana. Hudson Bay's southern arm is called James Bay. ↑ "About Our Great Lakes -Great Lakes Basin Facts- NOAA Great Lakes Environmental Research Lab (GLERL)". Archived from the original on 8 March 2012. Retrieved 7 May 2016. 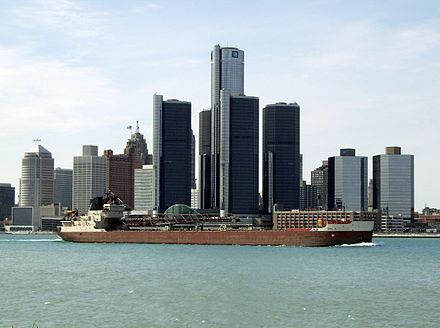 ↑ "Economy of the Great Lakes Region" . Retrieved 7 May 2016. ↑ U.S Army Corps of Engineers (January 2009).Great Lakes Navigation System: Economic Strength to the Nation Archived 2011-07-18 at the Wayback Machine . Retrieved on July 27, 2010. 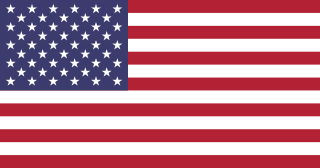 ↑ "Home - Federation for American Immigration Reform". Archived from the original on 17 March 2012. Retrieved 7 May 2016. ↑ "Ontario Population Projections" . Retrieved 7 May 2016. The Niagara River is a river that flows north from Lake Erie to Lake Ontario. 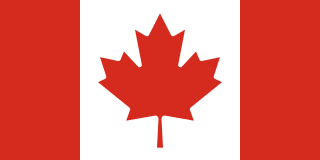 It forms part of the border between the province of Ontario in Canada and the state of New York in the United States. There are differing theories as to the origin of the river's name. According to Iroquoian scholar Bruce Trigger, Niagara is derived from the name given to a branch of the locally residing native Neutral Confederacy, who are described as being called the Niagagarega people on several late-17th-century French maps of the area. According to George R. Stewart, it comes from the name of an Iroquois town called Ongniaahra, meaning "point of land cut in two". The Great Lakes Waterway (GLW) is a system of natural channels and canals which enable navigation between the North American Great Lakes. Though all of the lakes are naturally connected as a chain, water travel between the lakes was impeded for centuries by obstacles such as Niagara Falls and the rapids of the St. Marys River. The Snowbelt is the region near the Great Lakes in North America where heavy snowfall in the form of lake-effect snow is particularly common. Snowbelts are typically found downwind of the lakes, principally off the eastern and southern shores. Lake-effect snow occurs when cold air moves over warmer water, taking up moisture that later precipitates as snow when the air moves over land and cools. The lakes produce snowsqualls and persistently cloudy skies throughout the winter, as long as air temperatures are colder than water temperatures, or until a lake freezes over. 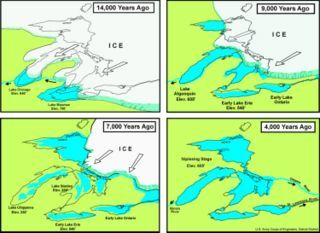 Early Lake Erie was a prehistoric proglacial lake that existed at the end of the last ice age approximately 13,000 years ago. The early Erie fed waters to Glacial Lake Iroquois. 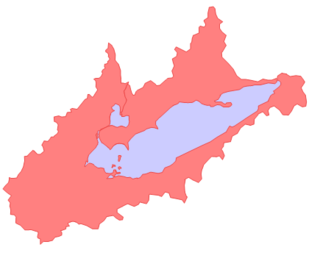 The Niagara Frontier refers to the stretch of land south of Lake Ontario and Lake Erie and extending westward to Cleveland, Ohio. The term dates to the War of 1812. This only includes the land east of the Niagara River and south of Lake Erie within the United States. The western side of the Niagara River on the Canada/Ontario side is the Niagara Peninsula and is considered part of the Golden Horseshoe. 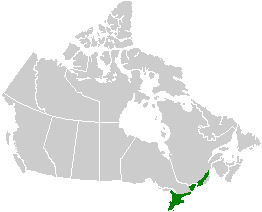 Ontario is located in East/Central Canada. 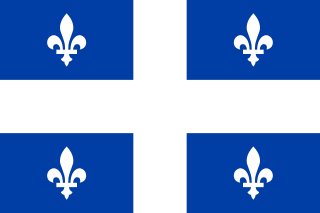 It is Canada's second largest province in total land area. Its physical features vary greatly from the Mixedwood Plains in the southeast to the boreal forests and tundra in the north. Ontario borders Manitoba to the west, Hudson Bay and James Bay to the north, Quebec to the east, and the Great Lakes and the United States to the south. 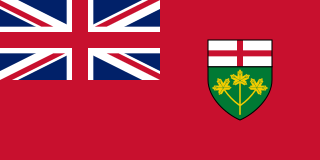 The province is named for Great Lake Ontario, an adaptation of the Iroquois word Onitariio, meaning "beautiful lake", or Kanadario, variously translated as "beautiful water". There are approximately 250,000 lakes and over 100,000 kilometres (62,000 mi) of rivers in the province. Lake Erie Basin consists of Lake Erie and surrounding watersheds, which are typically named after the river, creek, or stream that provides drainage into the lake. The watersheds are located in the states of Indiana, Michigan, New York, Ohio, and Pennsylvania in the United States, and in the Province of Ontario in Canada. The basin is part of the Great Lakes Basin and Saint Lawrence River Watershed, which feeds into the Atlantic Ocean. 80% of the lake's water flows in from the Detroit River, with only 9% coming from all of the remaining watersheds combined. A littoral zone serves as the interface between land and lake, being that portion of the basin where the lake is less than 15 feet (4.6 m) in depth. The Laurentian Upland is a physiographic region which, when referred to as the "Laurentian Region" or the Grenville geological province, is recognized by Natural Resources Canada as one of five provinces of the larger Canadian Shield physiographic division. The United States Geological Survey recognizes the Laurentian Upland as the larger general upland area of the Canadian Shield. The Eastern Great Lakes lowland forests is a temperate broadleaf and mixed forest ecoregion of North America, mostly in eastern Canada. The Eastern Great Lakes and Hudson Lowlands region extends along the south shores of Lake Erie and Lake Ontario and the St. Lawrence River to Lake Champlain, and south down the Hudson River. It is primarily within the state of New York, with smaller portions in Pennsylvania and Ohio. In the north it meets the Mixedwood Plains Ecozone of Canada. It is mostly temperate deciduous forest and agricultural land. The Mixedwood Plains Ecozone is the Canadian ecozone with the most southern extent, covering all of southwestern Ontario, and parts of central and northeastern Ontario and southern Quebec along the Saint Lawrence River. It was originally dominated by temperate deciduous forest growing mostly on limestone covered by glacial till. It is the smallest ecozone in Canada, but it includes the country's most productive industrial and commercial region, and is home to nearly half of Canada's population, including its two largest cities, Toronto, Ontario and Montreal, Quebec. Hence, little of the original forest cover remains, making protection of the remaining forests a high conservation priority. This ecozone includes two regions described by J.S. Rowe in his classic Forest Regions of Canada: the entire Deciduous Forest Region, and the southern portions of the Great Lakes-St. Lawrence Forest Region. In the province of Ontario, the Ontario Ministry of Natural Resources maps this area as Site Regions 6E and 7E. The Erie Plain is a lacustrine plain that borders Lake Erie in North America. From Buffalo, New York, to Cleveland, Ohio, it is quite narrow, but broadens considerably from Cleveland around Lake Erie to Southern Ontario, where it forms most of the Ontario peninsula. The Erie Plain was used in the United States as a natural gateway to the North American interior, and in both the United States and Canada the plain is heavily populated and provides very fertile agricultural land. The Saint Lawrence River Divide is a continental divide in central and eastern North America that separates the Great Lakes-St. Lawrence River Basin from the southerly Atlantic Ocean watersheds. Water, including rainfall and snowfall, lakes, rivers and streams, north and west of the divide, drains into the Gulf of St. Lawrence or the Labrador Sea; water south and east of the divide drains into the Atlantic Ocean or Gulf of Mexico. 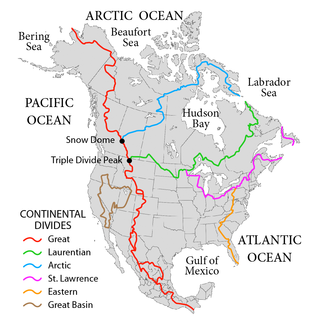 The divide is one of six continental divides in North America that demarcate several watersheds that flow to different gulfs, seas or oceans. The Portage Escarpment is a major landform in the U.S. states of Ohio, Pennsylvania, and New York which marks the boundary between the Till Plains to the north and west and the Appalachian Plateau to the east and south. The escarpment is the defining geological feature of New York's Finger Lakes region. Its proximity to Lake Erie creates a narrow but easily traveled route between upstate New York and the Midwest. Extensive industrial and residential development occurred along this route.